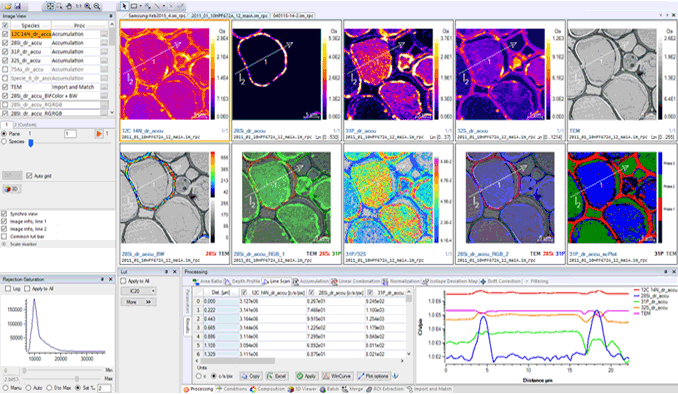 Specifically developed for CAMECA SIMS instruments, WinImage II offers powerful image visualization, processing & printing capabilities in a user-friendly environment. WinImage II allows to easily process images and stacks of images generated by CAMECA Microsoft and UNIX acquisition programs on all magnetic sector SIMS instruments (*.im file types). The WinImage II licence is delivered with a dongle allowing installation on several PCs and laptops but restricting usage to one computer at a time. WinImage II is a PC-Windows™ based program (W7 or W10 , 64 bits), with associated flexibility (direct copy-paste in reports or presentations) and easy learning (standard interface and ergonomics). Using WinImage II, SIMS image files can be quickly loaded and processed. The results or extracted information can be efficiently formatted and directly inserted in reports or presentations.